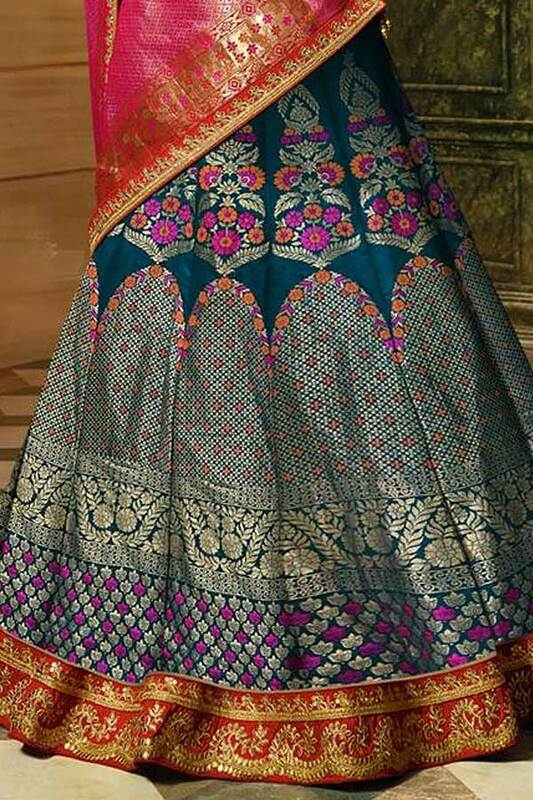 You have added Deep Cyan Silk Jacquard Lehenga Choli with Jacquard Dupatta to your Shopping Bag! Look drop-dead gorgeous in this stunning deep cyan silk jacquard lehenga choli! The colour combination of this designer lehenga choli is to die for. The jacquard silk lehenga with floral patterns embodies elegance. The hem of the lehenga is bordered with a beautiful lace. The lehenga is teamed with embroidered silk blouse/choli. The overall look is accentuated with pink jacquard dupatta. Finish your ethnic look with traditional jewellery and you are ready to attend any wedding ceremony or a family function. Ombre Green & Red Jacquard Designer Lehenga Choli With Zari..